Unlike some sights on Halloween, spotting a big gopher frog after dark in a tortoise burrow was a welcome surprise for Vanessa Kinney Terrell and other University of Georgia researchers. Even better, the next night they caught the adult frog (above) as it hopped out of the burrow at Williams Bluffs Preserve. “It’s very encouraging,” said Terrell, a research professional at UGA’s Warnell School of Forestry and Natural Resources. The loss of intact upland sandhill habitats and nearby fishless wetlands needed for breeding have reduced Georgia’s gopher frogs to about 15 populations. The species that inhabits gopher tortoise burrows and sounds like a rude dinner guest is state-listed as rare and petitioned for federal listing, said senior wildlife biologist John Jensen of the Georgia DNR’s Nongame Conservation Section. Working with UGA and other partners, DNR began collecting gopher frog eggs from healthy populations, rearing them, and releasing tadpoles and metamorphs at Williams Bluffs in 2007. The Nature Conservancy preserve near Blakely had the habitat but no gopher frogs. Drought in recent years has dried up the temporary, fishless ponds so critical for these frogs, affecting releases – which have exceeded more than 4,300 frogs – and presumably the breeding of mature frogs. UGA has been experimenting with releasing older frogs into tortoise burrows. According to Warnell associate professor Dr. John Maerz, the most recent check of 41 burrows that received direct releases showed an occupancy rate of 24 percent, which, combined with previous monitoring, suggests even higher overall occupancy. Jensen and others hope this winter will yield evidence that gopher frogs are breeding at Williams Bluffs. 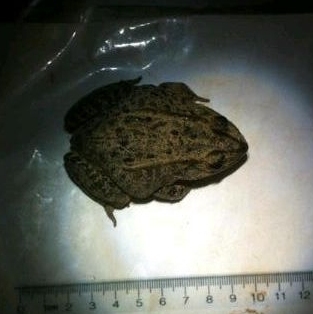 Automated “frog loggers” will be set to record the species' snore-like calls. And if the ponds fill, researchers will hunt for egg masses. “If we get the right rains … we have no reason to believe they can’t breed there,” Jensen said. The Williams Bluffs project may not only be close to establishing a breeding population, the work is also showing the potential of terrestrial frog releases and “clearly establishing the critical role that gopher tortoise burrows play in the viability of gopher frog populations,” writes UGA’s Dr. John Maerz. Project partners include Atlanta Botanical Garden, DNR’s Nongame Conservation Section, the Joseph W. Jones Ecological Research Center, The Nature Conservancy, UGA and Zoo Atlanta. 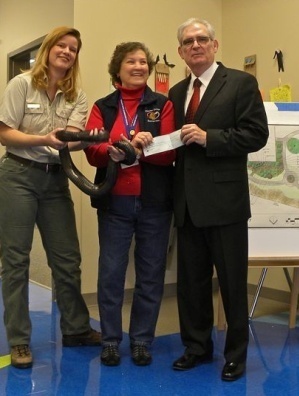 Bear Hollow Zoo in Athens has also helped. The gopher frog’s range includes Florida, the Carolinas, Alabama and – oddly – one area of Tennessee. The Mississippi gopher frog, now found in only a few sites in Mississippi, is federally listed as endangered. A similar effort involving the Mississippi gopher frog has evidence that the released frogs are breeding. Nongame Conservation Section annual report. “Georgia Outdoors” episode “A Fight for Frogs”, which documents efforts to save gopher frogs in Georgia and explores the at-risk state of many other amphibians. One of my favorite wildlife food plants is the common persimmon, but it’s not a plant that I have showered with much attention. In fact, the only thing I have done for this small tree in more than three decades is save it from the bulldozer when my wife and I built our home. Despite the lack of TLC, the persimmon is a valuable addition to my home landscape. 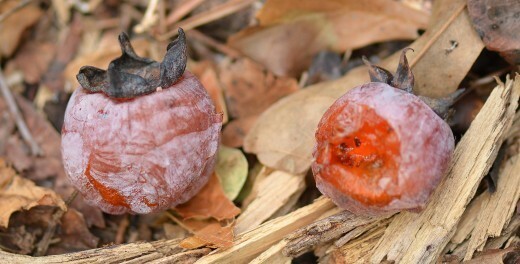 Of course, if picked at the wrong time, the extremely bitter taste of a persimmon is something you’ll never forget! The persimmon is also ingrained in Southern culture, has wood so hard it was once used to make golf club heads (Georgia’s own Bobby Jones played with persimmon woods) and grows seeds that can help forecast winter weather – at least according to folklore! Read more in Terry's full column, including how to tell a ripe persimmon (without getting a puckered mouth). Terry W. Johnson is a former Nongame program manager with the DNR Wildlife Resources Division and executive director of TERN, the Nongame Conservation Section’s friends group. His “Out my backdoor” columns are archived here. The new DNR Wildlife Resources Division app makes everything from species profiles to recreational license details available on the go. Powered by Pocket Ranger® technology, the Official Georgia Fishing, Hunting & Wildlife Guide also allows users to track friends’ locations, mark trails with photo waypoints and pinpoint wildlife sightings via GPS. Download the free app at the Apple App Store and Android Market (search for “GA Fish & Wildlife Guide”), or learn more here. North Atlantic right whales are returning to the coast of Georgia, Florida and South Carolina, calving grounds for the imperiled species. Only six calves were documented in winter 2011-12, a 10-year low and far fewer than the average of about 20 calves a year during the past decade. To help raise awareness of these endangered mammals, the fourth annual Right Whale Festival is set for Nov. 17 at Jacksonville Beach, Fla.
A free app from the U.S. Environmental Protection Agency connects users to pollution information on local lakes, rivers and streams. Check out “How’s My Waterway” here. A drug-related search of a Gilmer County home Oct. 5 turned up a mounted owl and a mounted hawk. Called to help the drug task force, DNR Cpl. Casey Jones and Ranger 1st Class Joe Hill seized the mounts and obtained arrest warrants for the suspect, who turned himself in Oct. 10. Pickett’s Mill Battlefield Historic Site has the largest population of Georgia aster known on public lands in the state. DNR botanist Tom Patrick, Atlanta Botanical Garden, and state and federal transportation staff recently counted about 3,400 stems at the Civil War battlefield, second only to a population of the state-threatened plant at Lake Russell Wildlife Management Area on the Chattahoochee National Forest. The Chattahoochee Fall Line Conservation Partnership is calling for volunteers to help plant native grasses among young longleaf pines 10 a.m.-3 p.m. Nov. 28-Dec. 1 at The Nature Conservancy's Juniper East Conservation Area in Marion County. Space for the restoration effort is limited and preregistration is required. Contact CFLCP2012@aol.comor or (706) 571-2500 to sign up for part of a day or more. Two Florida panthers on the loose at White Oak Conservation Center near Yulee, Fla., have been re-captured. The 18-month-old panthers were tracked by radio collar and did not stray far after Hurricane Sandy blew a tree down on their pen, allowing the endangered cats to escape. Ozark hellbenders have been bred in captivity – again – at the Saint Louis Zoo. The zoo’s Ron Goellner Center for Hellbender Conservation recently announced that eight female Ozark hellbenders laid a total of 2,809 fertile eggs in simulated streams, only the second time the endangered amphibians have bred in captivity. +video "11-foot python found in Charlton County (Ga.)," WTEV-47 Jacksonville, Fla.
coastal Georgia plants and doubling as an outdoor classroom. treated to a wildlife presentation by DNR Wildlife Resources Division staff.